Take a bowl and add whole black gram and red kidney beans. Add water to the lentil mixture and wash well. Add fresh water to lentil mixture and soak them overnight. Drain water from the soaked lentil mixture and take them into a deep bowl. Measure 200ml of soaked water and add to the lentils. Place the lentil bowl in pressure cooker and cook on high flame. After first whistle, lower the flame and cook the lentils for 15 minutes. Allow the pressure cooker to cool down completely and then remove the bowl from it. With the help of a potato masher, mash the cooked lentils till slightly crushed. Wash and chop tomatoes into small pieces. Peel and chop onion into small pieces. Wash green chilies and ginger and also peel garlic. Chop the green chilies, ginger and garlic using a mini chopper or using a knife. Wash tamarind and take it into a microwave safe bowl. Add 30ml water to the tamarind and place the bowl in microwave oven and cook on high power for 40 seconds or till water starts boiling. Cool the tamarind mixture and grind in a mixer grinder and strain to remove pith and extract clear juice. Heat a pan and add ghee. 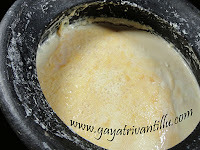 When ghee is melted, add cumin seeds and fry till they splutter. Add asafetida and turmeric powder and mix. Immediately add chopped green chilies, ginger and garlic mixture and fry well. Then add chopped onions and fry stirring till they are translucent. Now add chopped tomatoes and mix well. Add salt and mix again. Cover the pan and cook on medium flame for 3 minutes till tomatoes are soft. Add the garam masala powder, cooked lentils, and tamarind pulp and mix well. Mash the mixture with a potato masher to get required texture. Add red chili powder and mix well. To get the required consistency add sufficient water (150ml) (soaked lentils water) and mix well. Cover the pan and cook on low flame for 5minutes. Remove the lid of the pan and stir the mixture well. Switch off the flame and add cream and mix well. One may even add butter instead of cream. Adding cream gives a smooth texture. Transfer the curry into a serving bowl and garnish with the extra cream or butter. Serve this dal makhani with roti or naan or with hot rice. Soaking the red kidney beans overnight makes them cook easily. If wished whole black gram may be soaked for 4 to 5 hours and red kidney beans overnight. If forgot to soak beans overnight wash the beans & dal and add them into a flask and add hot water and close the lid. After 3 or 4 hours empty contents of the flask to a bowl and observe that they are soaked. We not only get taste but also texture from the whole black gram and red kidney beans. 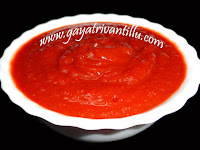 No extra spice powders are added and the soft flavor comes from dal, rajma & cream. If cream is not available add butter. Use an iron pan to get rich color of the dish along with the good benefits of iron. To get uniform texture one can also churn the dal makhani at the end with PAPPUGUTTAM. Serve hot this dal makhani with roti or naan or with hot rice.